Please tell fisheries policy makers to protect glass eels. Glass eels on an “eel-a-vator.” Robert Lorenz. CT DEEP Marine Fisheries Division is hosting a public hearing on the Atlantic States Marine Fisheries Commission’s American Eel management plan next Tuesday, June 24 at 7:00 pm at Dinosaur State Park in Rocky Hill. Please come and bring your friends–just a few citizens speaking up on this issue will make a huge difference. If you can’t come in person, please take a few minutes to send the Commission your thoughts. Need more information? Our glass eels handout has a brief overview of the issue. Ask them to protect glass eels so our American eel population can recover. The public comment deadline is July 17, 2014. Comments can be submitted to Kate Taylor (comments@asmfc.org) with the subject line American Eel, and please send us a copy: lmcmillan@ctenvironment.org. American eels are an important food source for migratory birds and game fish. They spawn in the ocean and then navigate upstream to spend 20-40 years in freshwater lakes and ponds as they mature into adults. Conservation groups and the state of Connecticut have spent significant money to open up passages and remove dams throughout the state to let the eels get upstream each spring. The eels face big threats from overfishing, as smoked eel is an expensive delicacy in Asian markets. They’re in so much danger that the U.S. Fish and Wildlife Service is considering putting them on the Endangered Species List. Here in Connecticut, Governor Malloy recently had to veto a law that could have allowed a fishing season for glass eels. A stunning migratory species, glass eels begin their lives in the Sargasso Sea. Each spring, huge numbers come up the Atlantic coastline, gathering at the mouths of rivers and streams. They begin to navigate upstream past dams and rapids, which usually happens in Connecticut as the water warms through April and May. The eels will often spend 20-40 years in these freshwater ponds and lakes, although males frequently reside in brackish estuaries. Once they begin to obtain pigment, glass eels are called elvers, then grow into yellow eels that will live in Connecticut for the next couple of decades before transforming into silver eels and returning to the Sargasso Sea to spawn. Eels in their silver phase are migratory and non-feeding, even though they travel over 1,000 miles back to the Sargasso Sea. 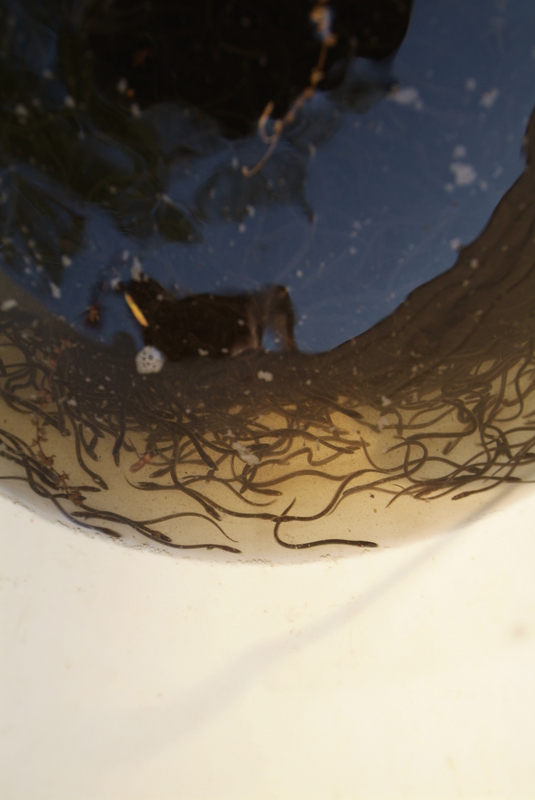 Glass eels in a bucket. Robert Lorenz. Eels are some of the only fish that spawn in the middle of the ocean and then spend their adult lives in freshwater areas—most migratory species do the opposite. 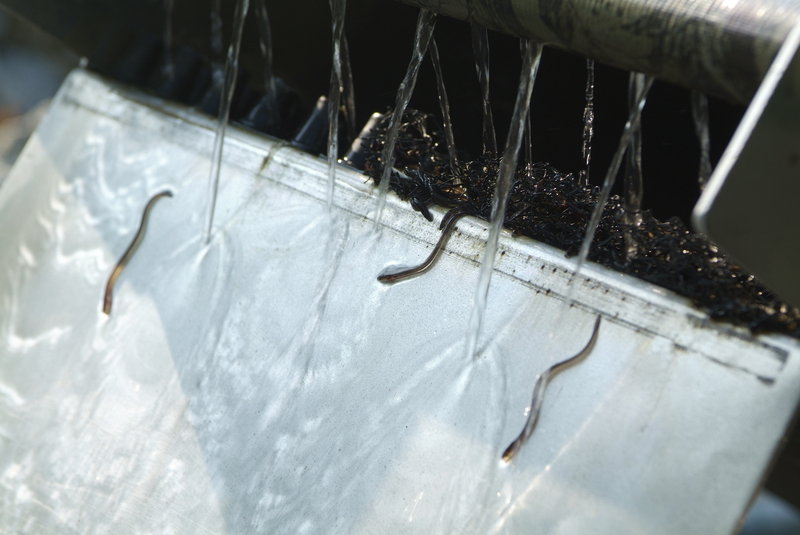 Advances like “eel-a-vators,” which provide paths past dams for glass eels, help them to complete their migratory journey safely. Eel passes provide eels with a damp, rough surface and use the eels’ desire to swim against the current by flowing water down the ramp. But even if eels can make it safely upriver, they are often killed on their journey back downstream by turbines in hydroelectric dams. Glass eels are important to recreational and commercial anglers. While the eels themselves aren’t typically caught, bluefish and striped bass (which anglers in Long Island Sound love to catch!) depend on eels for survival. Many anglers also use glass eels as bait and they were historically an important food source for humans too. They’re also eaten by beluga whales and cormorants. Things besides dams endanger eels—heavy metal poisons in the environment hurt them too. Climate change, which will likely move global ocean currents, might harm their migration patterns. Climate change may also exacerbate the effects of parasites that attack eels. But overfishing is their biggest problem, since smoked eel is prized in many Asian countries, particularly in Japan where it’s a staple in sushi (even though eel must be cooked to neutralize a dangerous neurotoxin). Eels already have been drastically overfished in Asia, leading dealers to purchase glass eels from the United States instead, where they fetched the high price of $2,600 per pound in 2012. They’re then flown overseas and farmed to market size. In Japan, they’re thought to help beat summer fatigue and have high levels of Vitamins A and E.